(left to right) Commercial Attaché Jeremiah C. Reyes, PTIC-Jakarta, Ms. Thelma Victorio, Incoming President of PWA Indonesia, Ms. Marvie Rances Samala, Senior Vice President, Blibli.com, Ms. April Cabello, TRANSDIGITAL, Ms. Stella Arungayan, Outgoing President of PWA Indonesia, and Vice Consul Jacqueline Arquiza, Philippine Embassy in Indonesia. 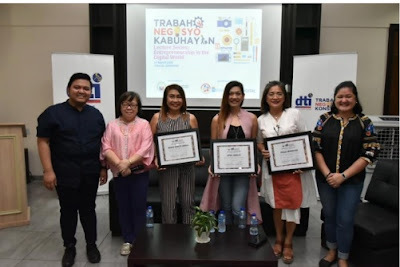 JAKARTA - The Department of Trade and Industry, through the Philippine Trade and Investment Center – Jakarta (PTIC-Jakarta) conducted its first Trabaho, Negosyo, Kabuhayan (TNK) Lecture Series: Entrepreneurship in the Digital World on 16 March 2019 at the Embassy of the Philippines in Jakarta, Indonesia. Attended by more than seventy (70) would-be entrepreneurs, the TNK Lecture Series is part of the year-long events for the commemoration of the 70th year of Philippines-Indonesia bilateral relations. The TNK Lecture Series: Entrepreneurship in the Digital World is the first for the year, which tackled opportunities and promotion of women entrepreneurship through e-commerce and social media. Ms. Marvie Rances Samala of Blibli.com and Ms. April Cabello of TRANSDIGITAL served as the resource speakers during the lecture. Blibli.com is one of Indonesia’s largest e-commerce platforms while TRANSDIGITAL, part of CT Corp, is the largest consumer conglomerate in Indonesia. The TNK Lecture Series: Entrepreneurship in the Digital World is brought to you by PTIC-Jakarta in partnership with the Embassy of the Philippines in Indonesia, and the Philippine Women’s Association – Indonesia (PWA Indonesia). The next TNK Lecture Series will be conducted in July 2019.